you MUST read this before giving or seeking informed consent. Near the end of 2005, my wife Lyn and I were at one of the largest surgical hospitals in the country, waiting to give her informed consent for surgery to remove the second vertebra (C2) from her neck. Lyn had a congenital form of bone cancer, Chordoma. The cancer had been found in a routine X-Ray following a car accident almost a year before and we had been to a half dozen local oncologists and orthopedists before we were sent to a large cancer hospital and then referred to the surgical hospital. Traditional treatments for bone cancer like radiation or chemotherapy had been ruled out long before as too risky or ineffective. Doctors had told us that with Chordoma, there were only two outcomes if untreated. The first was that the cancer would travel to her head, causing fatal bone spurs to grow into her brain. The alternative was that the weakened vertebrae would simply break apart. If that happened, the spinal cord would be severed, and her brain would lose control of her heart and lungs. She would literally have dropped dead, or had her brain crushed by bone tumors from within. Lyn was very fearful of losing her mind if the cancer reached her brain, and had decided to take the surgical route. The confidence of the doctors, especially the surgeon who would be performing the surgery, led her to decide this was her only chance to live a longer life. Yet I sit here, alone since 2008, missing her. You see the surgeries did not go well. Following the second phase of Lyn’s C2 Chordectomy an ischemic stroke deprived almost a third of her brain of the blood it needed to survive. It left her mostly paralyzed and in permanent pain. The woman who walked into the hospital with me at her side… my wife of almost thirty years… rode home in ambulances six months later. most of which we spent in the Intensive Care Unit (ICU) together. She was unable to walk or eat, with a whisper of a voice, and had a tube in her stomach for feeding, a permanent catheter for urinating, and a bag attached to her stomach where her colon had been removed due to complications during recovery. She cried in her sleep for the next three years, while I sat next to her. I was unable to do anything but manage her care in our home, which had become the ICU we thought we had escaped from. Eventually the results of that stroke, not the cancer, ended her life with her decision to stop eating and drinking. I sat by her side as she took her last breaths. 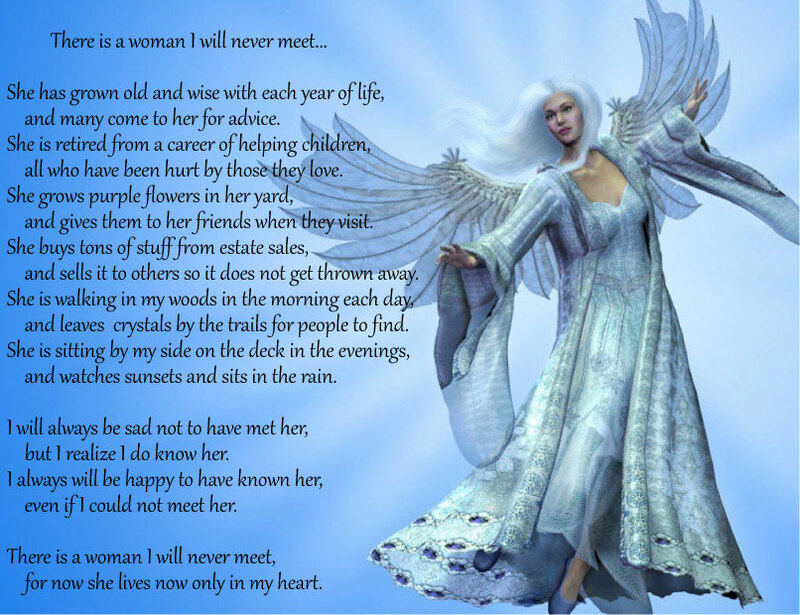 After almost 30 years together, I was left alone with a massive emotional hole in my heart that will never fully heal. For a long time, I focused on surviving the greatest emotional suffering most could ever even imagine, the loss of my wife. I waited for the intense pain of what we had gone through together to abate. Eventually I realized that my heart would always hurt from the loss I felt, and I learned I could live with that pain. I decided to instead focus on giving our experience a greater meaning. I returned to school, earned a Master’s degree in health care administration and became a Patient Care Advocate. From great adversity often come great advocates. I try very hard not to second guess the decisions we made then to have the surgery, but I have had the most difficulty coming to terms with one lingering question… were we given the information we needed to truly allow Lyn to give informed consent? In order to answer that question, one needs a clear understanding of what informed consent is and the value it provides. I hope that by explaining this answer to patients who are facing similar choices, I can save them or someone they know from making a wrong choice. I also hope to show their doctors how to ensure truly informed consent is given. I also write this with doctors in mind… if you are a doctor, I hope I can instill in you the desire to examine how you pursue consent from your patients. Although what I am about to say may make some of them uncomfortable, my goal is to help them to live well with the ethical ramifications of the pursuit of consent by ensuring that consent, when given, is truly an informed decision. So let us start at the beginning. 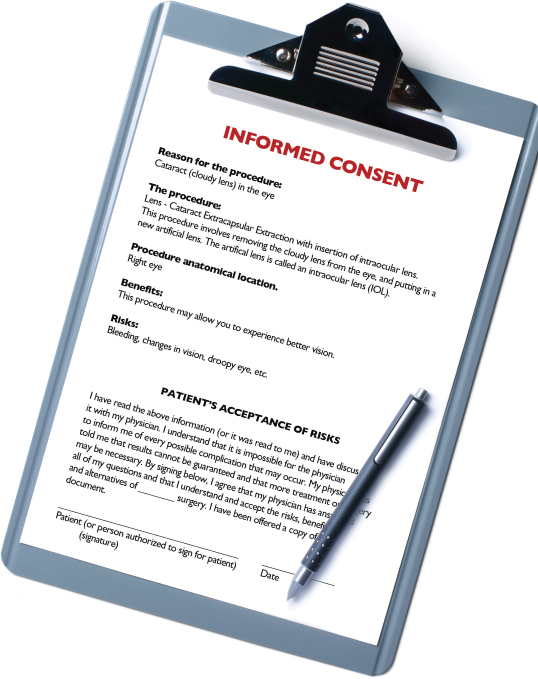 What is informed consent? Informed consent is generally given in the form of a patient signature on a form prior to every procedure or treatment in a health care setting, from surgery to participation in clinical trials. As described by Aiken (2009), it has 8 components. The form must include the name of provider(s), the patient diagnosis, a disclosure of conflicts of interest, a description of the procedure or treatment and its purpose, a description of the potential risks, likely outcome and available alternatives and a statement of consequences of no treatment. Health care professionals have several key responsibilities when seeking informed consent. It is specifically the responsibility of the physician performing the procedure/treatment to obtain the consent, although the actual presentation of the form can be accomplished by his/her authorized agent, such as a Physician’s Assistant. Others providers (ex. 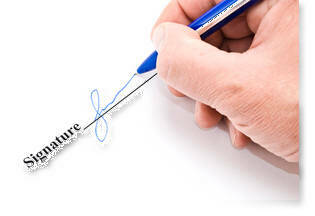 nurses) can act as witness to the signature. Effort must be made to ensure that patients who speak a different language are provided with translation services. When circumstances require a third party (a spouse or other proxy holder) to give the patient’s consent, the conversation leading to that must be documented as well. Truly informed consent requires a truthful statement of the potential risks and most likely outcomes. What happens when we can not trust our doctors to be truthful to us, or even possibly to themselves? 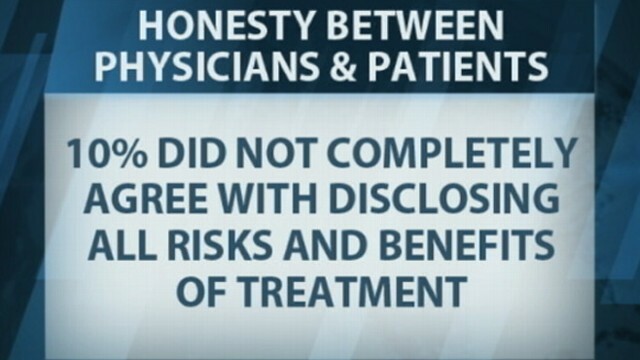 does that mean they would be less than truthful when seeking informed consent? All too often we make choices based on incorrect information. Lyn had been told the cancer would proceed a certain way, but my own research later shows that was not a certainty. 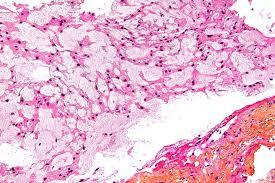 Without evidence of growth, a Chordoma site can stay dormant for years. Despite multiple X-Rays, CTs and MRIs there was no evidence to indicate that her lesion had grown in the ten months since it had been discovered. Not only were there possible flaws in Lyn’s diagnosis, there was an absence of personal opinions from those recommending the surgery. Not one doctor ever said “If it was me, I’d have the surgery.” Nor did they say, “If it was me, I’d skip the surgery and live my life to the fullest.” We did not ask them that question. We assumed that because they proposed it as a solution for her, it was what they would have chosen for themselves. And today, looking back, I believe that assumption was the single greatest mistake we made. He is correct… when futile care is brought to bear on a terminal illness, what is accomplished? 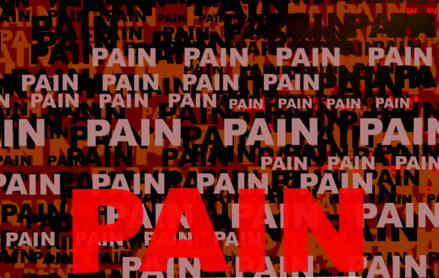 Often it nothing but pain, suffering and anguish. The last few days or weeks are spent clouded with medication to relive the pain and suffering, and often that pain is from the treatment itself. If there is no cure to grasp, no solution at hand… why then do we as patients often choose futile care rather than begin to prepare for death? I used to think it was because we are tenacious beings who simply want to live no matter what the cost. I felt that every day lived, regardless of accomplishment within that day, was important. I was wrong. This is the bitter pill of health care we all will likely face someday, either for ourselves or with someone we love… and it is simple. Accepting death in the face of a terminal illness is not giving up. I am not advocating that everyone with an illness that is terminal should forgo treatment… That is not what I mean. What I am talking to you about here is the situation where there is no realistic treatment that will have a positive outcome. It is fine to buy more time with treatment, but I am stating that we all need to understand what the quality of that time would be when making the decision to pursue it. When a surgery has a high risk, we are making a choice between treatment and doing nothing. Would we give up up months spent living, spending time with our friends and family, fulfilling our dreams and goals, checking off the items on our individual ‘bucket lists’… in exchange for a year or two spent extension of life spent in pain, staring at a ceiling, watching those who love us suffer along with us? Sometimes that is the actual question we are answering when we decide to give consent to a treatment or not. Sometimes giving informed consent means asking yourself “Do I trust this doctor to cut me apart and reassemble me without error?” Those are the actual choices Lyn made when she gave her consent. I believe we do not always receive the information we need to make that informed consent… and we need to understand why. Dr. Murray believes the reasons for this are three-fold: the patients, the doctors and system. Patients facing a life ending illness are scared of dying and overwhelmed by despair. Desperate for a different outcome, when a doctor offers them a choice of survival, no matter how slim it is, they grasp at it without thinking of the alternatives. If you are drowning and someone throws you a life preserver, do you look to see if it is tied to a boat or an anchor? 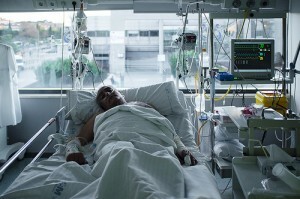 It is hard to blame a dying patient for wanting to live and despair does cloud one’s judgment. Then there are the doctors. Dr. Murray points out, even doctors “who hate to administer futile care must find a way to address the wishes of patients and families.“ He argues that because many doctors are poor communicators, they often find themselves in situations where they agree to the wishes of a patient and their family. They lack the ability to explain the downside of a particular treatment or course of action, and focus on the outcomes that end in success. It is, after all, a calling to save lives that brought most of them to their chosen occupation. Take his opinion along with the study I mentioned earlier… factor in that percentage of doctors who will lie about errors or give a rosier picture of a prognosis… and the blame shifts even more to them. I would add that, from my personal experience, sometimes it even goes a bit further. Surgeons in large hospitals are often under extreme pressure to perform high risk procedures to gain acceptance from their peers. Even the very best surgeons are often in a competitive environment, where their fellows grant them acclaim and acceptance based upon their ability to perform complicated procedures. Being able to meet the high performance standards set by others in their own field can drive them to minimize the risks of a procedure and even overstate their own skills when seeking a patient’s informed consent. When this occurs, the patient facing a high risk surgery is not always given a clear understanding of the realistic risks of complications. Doctor’s need to supply a patient with a complete view of the risks of the surgeries they seek consent to perform. They need to use words that patients can fully understand when explaining procedures and risks, and have an actual discussion of the risks of any surgery, not simply a passing statement of the likelihood of complications. If any of the doctors on Lyn’s consultation team had shown us the stroke care floor at the rehab we ended up in and told her she could end up there, I am certain she would have taken those few months or maybe even years walking, talking and living instead. All of this leads me to one inevitable conclusion, the one and only answer to the question that plagues me still. Lyn didn’t say no to the surgery because she had truly no idea what could happen. Back we go to that day a little over six years ago when they explained to Lyn what the surgery entailed while seeking her informed consent. Using clinical terms like ‘transmandibular approach’, barely discussing the elevated risks, and never once discussing the alternatives, Lyn was not told whether they would have the surgery themselves if faced with this diagnosis. I know we did not ask, but we did not know enough to be able to. They did know the risks and the high likelihood of failure and complications, and had an ethical obligation to tell Lyn what they knew. But they did not do so. I just wish I could accept it. I can understand now why Lyn made this choice, but that’s only because in hindsight I have knowledge that comes from study and wisdom that comes from experience. All I can do now is help others not to make the same mistakes, and if they do help them improve their outcome. As patients we are evolving into far more educated consumers. As more educated consumers, we are demanding transparency and the truth that comes along with it. as if was you lying in this bed. Tell us if you would have this surgery or treatment yourself whether we ask the question or not. illnesses and injuries and may not think to ask. Above all else, tell us the truth. Aiken, T. (2009). Legal and Ethical Issues in Health Occupations. St. Louis: Saunders Elsevier. Meisel, A. and Schenker,Y. (2011). Informed Consent in Clinical Care: Practical Considerations in the Effort to Achieve Ethical Goals. Journal of the American Medical Association. AMA. 2011;305(11):1130-1131. Morbidity, defined. A Wiki based open content dictionary. June 7, 2013. In the middle of February, 2006, I had been living in the neurosurgical ICU for the last few weeks hoping for my wife, Lyn, to wake up from a coma following a massive stroke. The stroke was a result of a high risk surgery to remove a cancerous vertebrae from her neck. Her surgeon had told us that the stroke had occurred becaus e Lyn had a congenital defect in her heart that had allowed a clot to reach her brain during the surgery. There was no evidence that this was the cause, and despite many tests in the coming weeks, there never was. An expert neurosurgeon from another hospital had been flown in to consult on Lyn’s case. 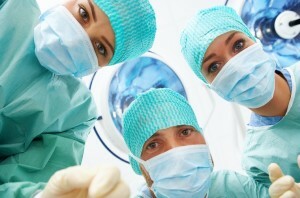 He had agreed with Lyn’s surgeon that the theory about her heart was valid and suggested some follow-up tests. While he was there he presented several of his cases to the surgical team of the hospital and, strangely, I had been invited to attend the presentation. I sat through a three hour presentation and watched with horror as he showed slides of his patients surgeries. I was the only person in the room not wearing a white coat. At the end he presented what he said was his most successful case. He told us he couldn’t show pictures of the patient because the patient had not given consent, but that he had decided he could show what had been removed during the surgery. On screen was a female body, from the lower abdomen down, lying on a stainless steel table. The patient had a spinal cancer that was very advanced, and he had removed her hips and legs in order to save her life. He went on to tell the room how well she had done following the surgery, even recovering to the point where she was able to return to work as a secretary, although she had to sit in a bucket instead of a chair. Then he explained that despite all he had done for her, she had let him down because years later she died from lung cancer. He said it was because she had so little respect for herself that she did not quit smoking. While many of the older doctors laughed along with him at that comment, most of the younger residents did not. I felt like I was in a room surrounded by humans who had fallen from God’s grace. At the end of the presentation, I was waiting for the elevator when Lyn’s surgeon and the expert approached me. He said how much he respected me for staying by Lyn’s side, and reassured me that her surgeon had not caused the stroke. Then he asked me if I wanted to go to lunch with them. I turned away, and with a mouth tasting of bile, I said words I will forever remember… “No thank you. There would never be a restaurant large enough go hold both of your egos and still have room for me to sit in.” Foregoing the elevator, I walked down the nearby stairs, back to Lyn’s side. Years later, I read what Max Lucado has written about air-rogance. He used the term to compare arrogance to climbing a mountain and breathing thin air. I realized that on that day I had briefly visited that mountain. What I saw there scared me so much that and I quickly climbed back down to reality. Many of the doctors in that room had been there so long they actually saw nothing wrong about their laughter regarding that patients death. They saw nothing disrespectful about that image of a discarded life, burned now into my memory. Worse than all of that, they acknowledged they felt the visiting surgeon had the right to be angry and disappointed that his patient had shown HIM such disrespect. Only the newer ones, hoping to find acceptance amongst their seniors but not fully acclimated to the thin air, remained silent. The most relevant quote is in Obadiah 1:3 “The pride of your heart has deceived you, you who live in the clefts of the rocks and make your home on the heights, you who say to yourself, ‘Who can bring me down to the ground?’ ” Isn’t it amazing that words written so long ago continue to have such relevant meaning? “The pride of your heart” is the arrogance that comes from unbalanced egotism. I say “unbalanced” because egotism is not necessarily a terrible thing- it is much like self-confidence, and it can come from a sense of self-pride that is well deserved amongst those who have great skills bestowed upon them. Yet egotism must be balanced by great compassion and humility, for to be uncaring of those who have lifted you up to that mountain is to risk a great fall from God’s grace. To those on that mountain, please… Come back down. The thin air of air-rogance will not sustain you. You can be forgiven you for being there, but only if you come back down. When you find yourself breathing that thin air, look for the stairs. A kairos moment in health care… can you name one from your life? The ancient Greeks had two words for what we call time. One was chronos, which referred to the linear progression of time itself. Chronos is the one day follows another method we measure the passage of time with, as in “yesterday, today and tomorrow”. Whenever we measure time in seconds, minutes, hours, days, weeks, years, decades or centuries, we are speaking of chronos time, or as we more commonly call it chronological time. The Greeks also had another word used to define time, kairos. This unique word is lost in our language, but its meaning is still with us. Kairos refers to specific moment (or moments) of time where we make a decision based on possibilities presented to us in that very moment. What makes these moments in time different than chronos time is their potential. A kairos moment has the potential to change the future based on the decision the person experiencing the moment makes. Obviously, in some ways life is filled with reflexive kairos-like moments. We couldn’t walk down the stairs without falling down them if we didn’t decide to move our feet forward and down with each step. Kairos moments are somehow different, moments where we make decisions we should not make casually or based on reflex. A kairos moment can be the second when a someone decides to say “I do” to a marriage proposal, or it can be the moment you and your spouse decide you want to have children. It can even be the moment you decide to give a homeless person the extra ten dollars you found in your wallet this week. A true kairos moment is when God gives us a unique opportunity to make a mindful decision to make a difference in our own or someone else’s life. A kairos moment in health care is no different, for both patients and providers alike. Putting aside his own feeling that he has failed to save a life, a doctor decides to advise a terminally ill patient that the treatment they are seeking may prolong their life but will likely have an adverse impact on the quality of the time they have left. He recommends they consider hospice instead of treatment. A nurse chooses to speak up on behalf of a patient in her care regarding the ethics of a doctor, knowing that although it will likely improve her patient’s outcome she will probably have to face repercussions from the respect she is given professionally by that doctor and her own peers in the future. A therapist decides to visit a discharged patient at their home to give them moral support in their recovery, knowing that it is against her employer’s policy to do so and risks punitive action from her employer by doing so. 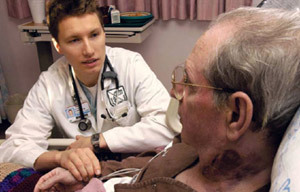 These are all examples of kairos moments in health care, where health care providers make a decision when they feel God has given them the opportunity to make a decision that shapes lives, a chance to express their compassion and love for the people they care for, regardless of the personal consequences. I have personally witnessed examples of all of these decisions, and can testify to the power they had to make a difference in the lives of others. It is not just providers that are given these opportunities to make life altering choices. 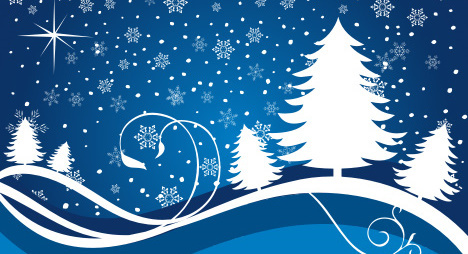 Patients, family members and friends get these wonderfully unique opportunities given to them when someone they or someone they love is recovering from an illness or injury or even dying from a terminal disease. Visiting in the hospital, offering a meal, offering companionship and even consciously praying for someone all have the potential to be kairos moments. Sometimes it goes even deeper, and we find ourselves challenged by God to make the right ethical or moral choice. 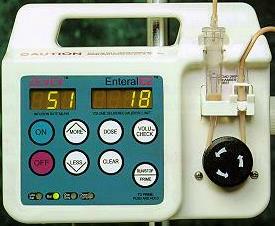 In 2006, I was living in the ICU of a major surgical hospital in Boston. My wife, Lyn, was struggling to survive a surgical stroke. We were in that ICU together for weeks on end, and I met other family members who were struggling as well. At my worst one day, when I was filled with self pity and feeling hopeless that we could possibly survive the ordeal, I met a young woman I will call Keisha and her parents. I’ll never forget them. Once I tell you about them, I doubt you will either. Keisha was 17. I met her parents in the waiting rooms one day, and they let me visit her whenever I wanted. She was an awesome young lady that I will never forget. She had been having tumors in her brain sue to a rare form of cancer all of her life. Over a dozen surgeries over a ten year period removing tumors had been performed successfully. She was back this time because after a two year remission, her latest scans showed three new ones. Keisha and her parents had decided to tempt fate one last time. It was an epiphany for me. My eyes opened through all the pain I felt and saw how hard it must be for anyone to actually be so accepting of their own death. To be so selfless and loving that the only reason a fighter – a survivor like her- the only reason she would give up would be her love of others. I remember holding her hand for hours over the next few days, rather it was her holding mine. I would quietly disappear back to Lyn’s side when her parents were around. After they would visit the three of us would get a bite to eat. They told me stories of their daughter growing up, how strong she was, and how they knew she would survive this and that eventually she would be OK, and I knew Keisha was right. She couldn’t live up to their expectations any longer. I said goodbye to Keisha after her parents left in preop before her last surgery. We held hands as the meds started to kick in. As she fell asleep, she looked at me and said, “Would you tell them I am sorry?” I promised I would. Keisha and her parents had created one of the most notable kairos moments in my life. I learned that day that the things we promise to do for those who are dying are not as hard as they may seem. It is an honor and a privilege to help someone at the moment of their passing. I am honored to have known Keisha. My memory of her and her softly spoken words helped me get through what came in the next few years. I hope it helps you someday. I share her story to honor her memory. In about two months it will be four years since my wife ended her own life. I still grapple with one very large question… does the act of ending one’s own life condemn us to an eternity of suffering? I believe the answer depends on what you hold as your own spiritual beliefs. In the Roman Catholic Church, with its strict and literal interpretations of the Bible, the answer would be yes. They believe that suicide is a mortal sin, and that to die with unforgiven mortal sins condemns one to hell instead of heaven. They also hold as truth that Christ conferred the power to forgive sins only upon the apostles and their successors. Anglican and Eastern Orthodox Catholic churches generally agree with this position. 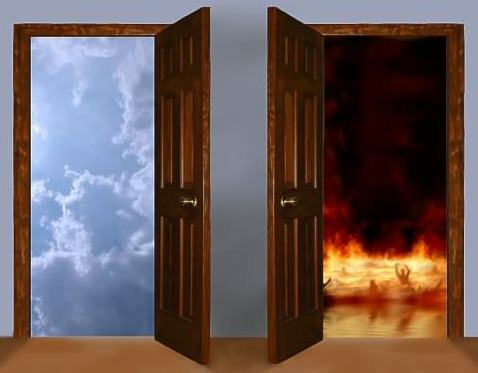 Since this view holds that only the Church itself can forgive sins, a person must do all that they can to ensure one enters eternity with the Church’s forgiveness for all their sins. This is why they administer “last rites” to those who are dying. Since the act of suicide would presumably take place after any possible administration of “last rites”, eternity is entered with unforgiven sins. The Protestant Christian view of sins and how they are forgiven resembles the actual scriptures more than that of the Catholic position. Protestant denomination believe that the actual scriptures hold greater authority than that of any church. They direct one to Christ as the only true redeemer of mankind and his sins. The Evangelical Christian view holds that all sins are forgiven the moment one accepts Christ as savior. This includes all sins, past, present and future. So we can see that one’s own beliefs and interpretation of the Bible must be what shapes the answer to this question. Let us return to the core question… does the Bible itself hold that suicide is justifiable at times? I believe that the answer is yes, it does. One specific instance is when the suicide is an act of redemption. 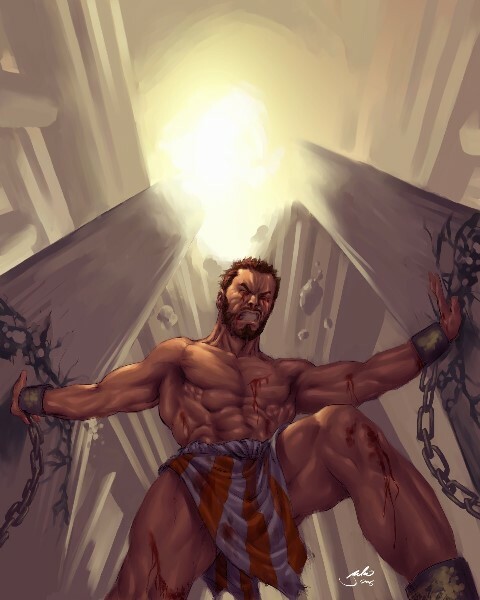 Samson, a wayward Israelite judge, had allowed himself to be compromised and imprisoned by Israel’s enemies. His prayer and subsequent suicide appear to be pleasing to God because he was acting to atone for his transgressions. Another specific instance would be a soldier in combat who throws himself in the line of fire to save his comrades in arms. So atonement and selflessness would seem to be justifiable reasons to end one’s life. Those instances do not apply to one who chooses a subtler form of suicide to end their own suffering, but since there are clear exceptions to the rule, there is room to explore further to find the answer. After all, where there is one exception there must be others. Going a step further, what about a person who is stable medically but in constantly increasing amounts of pain? 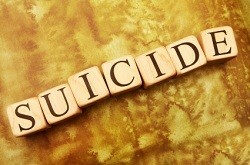 Is it a suicide to stop eating and drinking and let starvation end one’s own life? If it is, does that constitute a sin that will condemn one to hell? and there are no clear answers. and that is where the answer, for me, must be. My wife, Lyn, suffered greatly following a surgical stroke that left her mostly paralyzed. The surgery was to delay a congenital form of bone cancer that would have been fatal within a few years. The stroke destroyed parts of her brain that controlled motor control, pain perception and emotional control. After six months by her side in three hospitals, we had returned to our home, which was now an Intensive Care Unit. With 100 hours of staff coming and going weekly, I managed her home care for over two years. In that time she made great strides in recovery… she regained her voice and could eat some solid foods again. She would never walk. She would never smile. Worst of all, the pain she felt continued to increase to the point where to control it, she was practically sedated most of the time. She fought for 27 months to recover as much as she could, despite the pain. Awake and alert for only a few hours each day, she eventually decided to stop eating and drinking. She made us stop the tube feed. She said her goodbyes. After two weeks, she took her last breath with friends and myself at her side. I have at long last concluded that she went to heaven, and no one can tell me otherwise. She had time to make her decision. She had the ability to decide for herself. Her death was not an act of redemption. It was not an act of selfless valor. It was simply what came next. Once no more progress in recovery could be made, she decided what was left of her life was not worth the pain and suffering that each waking moment caused her. So she simply stopped living. Although her technical suicide was a sin, it was forgiven before it was ever committed. Christ loves us that much. That is my belief, as it was hers.